The NEW GIRL series finale had a (cursed) wedding and a birth, but the (fake) eviction series-closing eviction allowed the group to say goodbye to the loft many of them called home. Nick (Jake Johnson) and Jess’ (Zooey Deschanel) perfect wedding was derailed—thanks to an eye injury, a job loss, and Aly’s (Nasim Pedrad) water breaking—but the duo decided to go with the flow and got married at the hospital. However, Winston had the last laugh, when he revealed they weren’t evicted…he had just successfully pranked them. But with everything already moved out and in the truck, Nick and Jess left their old home behind. Nick and Jess’ wedding was, really, years in the making. What did it mean to you for them to have that come to fruition? Jake Johnson: It was really funny. I was really appreciative they gave Max and I the bit before that it was going to be us [getting married], because that led to a bunch of laughs. It was really fun. It’s different doing the thing, as opposed to watching the thing, because what we really cared about was having a lot of fun doing it. Certain scenes that might turn out really nice aren’t always the most fun to shoot. But that was a really fun scene and day to shoot. Josh Greenbaum directed it, and those were really tricky scenes. But he shot it in a way that it kept a nice pace, and everyone was in a good mood. It was actually a lovely day to do that on. The second part of the finale had the gang saying goodbye to the loft, and had a lot of fun callbacks to the series’ past. What was it like filming that, especially as you guys were also saying goodbye to the show? Max Greenfield: I think it was really funny, because knowing [series creator] Liz [Meriwether] as well as we do for as long as we have, you read that finale and go, “Oh, this is exactly how she wants to let go of the show.” We’re going to let Nick and Jess get married, and then I’m going to spend the next 22 minutes of them doing everything just one more time. Living that out, experiencing it, and letting it go. JJ: I think it was Liz’s perfect ending, and for that, it makes me happy. JJ: I may be giving the wrong answer, but that moment didn’t mean much to me playing Nick, because it’s very clear that Nick loves Schmidt. MG: It also felt like we had done it so many times. MG: Where we’re in a blimp. These sincere moments. JJ: I have done more scenes with Max Greenfield where I’m looking into his eyes, telling him how I feel about him, than I have with anyone else. More than Zooey! More than anyone I’ve acted with. MG: I didn’t have half as many scenes with Hannah like that. JJ: In terms of romantic comedy acting, my partner in crime is Max. Zooey and I were a love story in this, but we had years we were just buddies. I never had an episode where the direction wasn’t, “Jake! Look at him more lovingly.” [Both men laugh.] So for that, just tell him you love him, I was like, “Well, yeah. I’m sitting cross-legged, putting cream on my foot.” While we’re doing the flashback scene, his ideal woman looks like me. How is the “I love you” big?! We all know what the show was here. So for me, the I love you was there. It feels like no show really ends at this point. Would you be open to revisiting these characters at any point? MG: Jake had a good idea. Have it come back as a multi-cam. JJ: Here’s what I really feel about it: NEW GIRL was a marriage. It feels like we were all each other’s first wife or first husband. And we just signed the divorce papers. We’re really happy, we just walked out of the courthouse, and we’re like, “After all of that, I still like you!” So in terms of signing on to another show, I have to move down to Orlando, sign on to Tinder, and make a bunch of mistakes. [Greenfield laughs.] After a year and a half of just terrible life behavior, maybe I’ll be ready to date. MG: That really is what it feels like. JJ: I don’t know if we could come back. But if everybody is back, and the timing is right. It would really have to be that Liz would have a vision and would go, I’m writing every episode. And we’d have talks of how can we do the marriage better, how can we have more fun? And then we’d go back. But I think we all will always have the most love for this show. Because I think most of us—maybe not Zooey, because Zooey was a star before this, so I think she’ll always have a different level of love for this—but [for the rest of us], this is a show that gave us all careers. What are you going to miss the most about working together? MG: I’ll be honest: We had some good laughs on this show. I don’t think I’ll ever laugh like I did on another show. Truly, devastating laughter. JJ: It’s hard, because Liz Meriwether’s sense of humor asks you to be immature. The stuff we were asked to do as grown-ups…”What are you doing in this scene today?” “Did you see my wardrobe?” “No.” “Come to my trailer.” The crew would make fun of us. We would always be humiliated. We’d walk on set and the crew would be like, “You’re stupid and untalented!” So the vibe coming in was, “Let’s go baby.” And once we started leaning into it, we had so much fun. MG: Jake would always point it out: “Look at what we’re doing here. I just don’t get it.” And that would be one angle. But then the reverse angle would be like, after a lot of those moments, I’d be like, “I can’t believe we’re doing this.” And Jake would kill me. And those moments would end up in deep tears. JJ: I’m the same way. What I’ll miss the most is the amount of laughs we had. 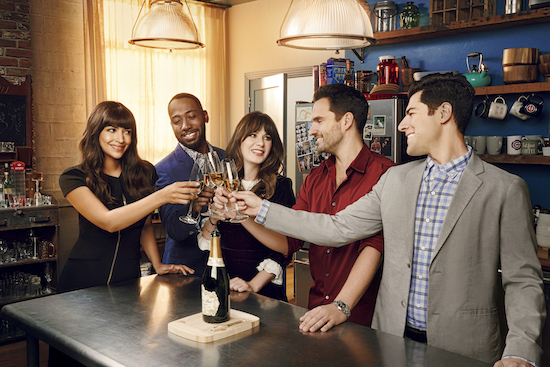 What did you think of the NEW GIRL series finale? NEW GIRL at PaleyFest: Jake Johnson Teases What’s Next for Nick and Jess. Plus, Teases From the Panel!